Please read this before message and take good note of EVERYTHING here. It have to be knowed when you decide to work with me. 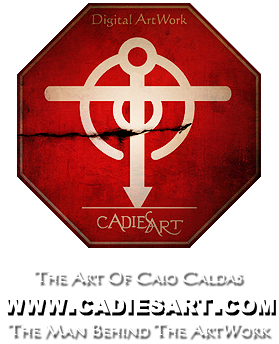 I'm Caio Caldas, freelance graphic designer, from Sao Paulo – Brazil, owner of CadiesArt - Digital ArtWork since October 2009. This is a Brazilian company specialized in musicians, bands, media. I'm Brazilian, but I speak English and Spanish too. I don't speak german, dutch, japanese, or any other language, so please when you send me an email, you can use Spanish, English or Portuguese. CD/LP Covers ArtWork; Complete CD/LP/DVD/BOXSET Packaging Design; T-Shirts ArtWorks; Stage Backdrop; Logo & Symbol Design; Flyers Promotionals designs; Full WebSite Design (in collaboration with www.nataliabraz.com, who also designed my website). How much do you charge for an ArtWork? I have some fixed prices for all my graphic services, but I work on demand and in regard of the stuff you want, so I can try to work within your available budget. I can do packages prices if you want to order more than one service. I also usually have artworks already made For Sale in my gallery. I have my prices for each one of the ArtWorks for sale base on complexity, concept, image costs and time-spend, if it's too much for you, in that case, I usually ask to the bands to make an decent offer if they find interest, so I can think about your offer (and no, USD $50.00 is not what I call a decent offer). For payments I accept paypal and bank transfer. If I have a concept/idea for an ArtWork. So after you give me the first preview for it, how many changes can you do on it? I can change the artwork 3 times after the first preview without any charge. If you still need more changes on it, I need to increase the final price with 10% of original value for each new preview (but this fee depends on what you want to change, maybe I can do for free if a simple change to get done). If I buy an ArtWork from your Gallery For Sale, can I ask you to make some changes on the artwork, it’s possible? YES! You can ask me to change anything on the art, but maybe this can increase the final price for it. What do I need to pay you to start the work? For > $200 I usually charge 60% of the total before start the work, and 40% during the work (the last payment can have a additional % or not). If you order an artwork from me, be sure you've money to pay it fast when work is done. Anyway, if you take some time to pay me when the work is already done and APROVED, I'll ask you feedback one or two times, and if I don't have news from you in two weeks about the payment, I'll re-sell the design, and I don’t will refund you the 60% already paid. Can I ask you to reserve an ArtWork from your gallery until I pay for it? For ArtWorks I've for sale in my gallery, if you want to reserve one, you've MAXIMUM one week to pay for it, or I’ll set it available again. Usually between 1 and 4 weeks. Depends on the job are you talking about, can be more if I have a lot of work when you order yours, but you'll be noticed. Can depend on how quick you answer to emails or previews too. No need to hit me every day asking "Hey, what's up! Any news???". I always get back to you by myself with a preview as soon as I'm happy with what I've done for you. What do I need to give you to get the best work possible ? Good ideas and concept for the artwork you want. Its better to tell me what you want with image references when possible. If needed show me some Covers that you liked from others bands, give me an idea of the artwork style are you looking for. If it’s a band Logo Design, show me some example with an image from another bands Logo. It will also allow me to let you know if I'm into what you expect. When we've agreed your preview, how does it work ? You’ve to pay me the TOTALITY of the work to get high def file. I never send a file before being paid in totality. I just send you preview with low quality and with watermark on it. If you are in a rush, pay in time. Payment have to be done through PAYPAL (I really prefer) at the following email adress : cadiesart@hotmail.com - but I can accept international bank transfer too. IMPORTANT : when you pay me, ALWAYS set your band name as note. I ALWAYS ask 1 copy of the original released work for my portfolio. It is an integral part of the deal between you and me. When your stuff is printed, get back to me to get my shipping postal adress. It's reference for me as a designer and very important, so respect that. For MySpace layout, I'll add on the bottom of the page, a little plate from my Brand and my credits with website and copyrights for the layout design. I also ask you to let people know I've worked for you. There's tons of way to do that. I also promote you on my website. So we work together. Can you print the work and send me it? I only do the Design of all ArtWorks, NOT printing, sorry. Up to you to find a printer in your area. Will be better for you! I’ve a question and I can't find my answer in your FAQ. I'm always available to receive emails here: caio-caldas@uol.com.br, just drop me a message, I always answer to everyone and very fast.